The Infamous Jane Shore – History… the interesting bits! 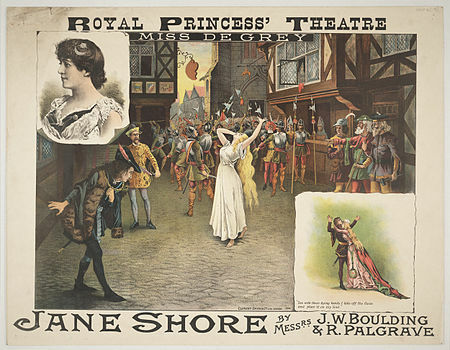 Jane Shore is one of the most renowned of royal mistresses, rivalling only Katherine Swynford in her fame. However, Jane was not so fortunate as Katherine; there was no ‘happily ever after’ with her royal lover. As she has gone down in history, the poor woman didn’t even get to keep her own name. So, who is Jane Shore? Well, she’s not called Jane, for starters. In fact, that name seems to have only been attributed to her more than 50 years after her death, and by a playwright, of all people. The young woman in question was born Elizabeth Lambert; she was the daughter of John Lambert, a citizen and mercer of London who died in 1487. Her mother, Amy, was the daughter of Robert Marshall, a London grocer, and died in 1488, the year after her husband. Elizabeth was probably born sometime before 1450 and was married, in her middle or late teens, to William Shore, a London goldsmith. Elizabeth eventually became mistress to King Edward IV, the larger-than-life king who reigned from 1461 to 1483, except for a little interval in 1470-71 when Henry VI briefly regained the throne. Mistress Shore first appears in the historical record in the mid-1470s, possibly when she was already mistress to the king, when she petitioned for an annulment to her marriage. The grounds for the petition was her husband’s impotence. While it was not unheard of for a wife to petition for the dissolution of a marriage, it was certainly a rare occurrence; such appeals were expensive and rarely granted against the husband. It may well be that Elizabeth was already mistress to the king when she brought the divorce petition, it would certainly explain her ability to finance the case. The whole proceedings would have been as humiliating for Elizabeth as it was for her husband, William; but her developing relationship with the king may have given her the encouragement to endure it. However the petition came about, a woman’s right to bear children was considered sacrosanct and the annulment was granted, the papal mandate being dated to 1 March 1476. 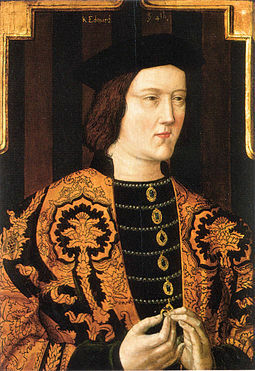 Edward IV is as famous for his love life as he is for his prowess in battle. His irregular, secret marriage to Elizabeth Wydeville provided enough ammunition and doubt for his brother, Richard of Gloucester, to declare his sons, Edward V and Richard (the Princes in the Tower), illegitimate and take the crown for himself. Gloucester claimed that Edward IV had already been married – again secretly – to one Eleanor Butler when he married Elizabeth Wydeville, making his children by Elizabeth illegitimate and therefore unable to inherit the throne. Of course, proof was lacking, but Edward’s own record with women provided sufficient doubt to enable Richard to seize the throne. There is little doubt that Edward IV and his queen, Elizabeth, were happily married; the couple had numerous children together, of which 6 girls and 2 boys survived infancy. However, this did not prevent Edward from taking mistresses, of which Elizabeth Shore is said to have been his favourite. Of course, we cannot truly say whether or not Edward loved Elizabeth Shore, nor how deep was their relationship. Nor can we say how Elizabeth Wydeville felt about her husband’s relationship with Mistress Shore. In fact, very little contemporary evidence exists to prove the existence of a relationship. At least, not while Edward was alive. 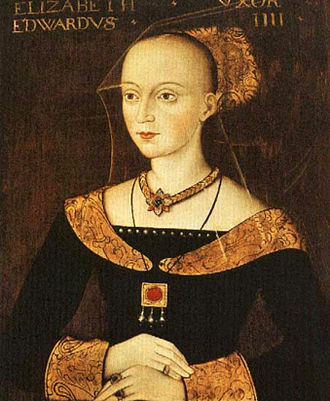 However, when Edward died in 1483 and his brother, Richard seized power, Elizabeth Shore was brought into the limelight, caught up in the power struggle following the king’s death and the accession of his 13-year-old son. On the king’s death, Elizabeth Shore was in need of a protector and transferred her allegiance and affection to William, Lord Hastings, the late king’s best friend. As the political situation deteriorated in 1483, following Richard Duke of Gloucester’s arrest of Anthony Wydeville, the new king’s uncle and brother of Queen Elizabeth Wydeville, the queen fled to sanctuary at Westminster Abbey. Elizabeth Shore was accused of carrying messages between the queen in sanctuary and Lord Hastings, who was serving on the Privy Council. Whether she did or not, or even whether the queen and Hastings were plotting, we’ll probably never know. 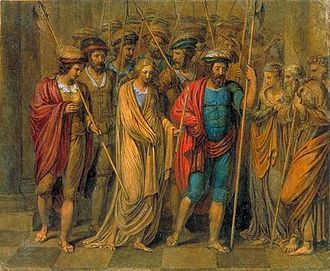 Elizabeth was eventually released from gaol, into her father’s custody, on the payment of sureties; however, it seems Lynom was not dissuaded by the entreaties of the king and the bishop. He and Elizabeth were married before her father’s death on 1487, as is made clear in his will, in which he left his daughter a bed of arras and a painted cloth of Mary Magdalen and Martha. Thomas Lynom survived the regime change of 1485, successfully transferring his services to the Tudors; he served bother Henry VII and Henry VIII and was a councillor for Arthur, Prince of Wales and controller of the rolls for the prince’s household. Thomas Lynom was dead by July 1518 and, according to More, Elizabeth fell on hard times after that, even claiming she had to resort to begging, although this seems unlikely. Elizabeth Shore probably died around 1527, although she had long since retreated from the limelight. There is no evidence that she ever had any children – the reason for the dissolution of her first marriage – and her story may have ended there, were it not for the Tudor playwrights. Her literary life was born through the works of William Shakespeare, Thomas Heywood and Nichols Rowe. It was Thomas Heywood who rechristened her ‘Jane’ and made her the focal point of his play, Edward IV, in 1599. However, despite the name change, the plays have, to say the least, guaranteed Elizabeth Shore’s place in history. Footnotes: ¹Edward IV and Elizabeth Woodville: A True Romance by Amy Licence; ² quoted by Rosemary Horrox in Oxforddnb.com. Sources: Edward IV and Elizabeth Woodville: A True Romance by Amy Licence; Elizabeth Shore – Jane by Rosemary Horrox in Oxforddnb.com; Richard III, England’s Black Legend by Desmond Seward; Edward IV, Glorious Son of York by Jeffrey James; Elizabeth Woodville, Mother of the Princes in the Tower by David Baldwin; Lancaster & York, The Wars of the Roses by Alison Weir, Richard III by Michael Hicks; Edward IV and the Wars of the Roses by David Santuiste. Another excellent post. Elizabeth (Jane) sounds like she knew how to take care of herself. It definitely makes you think about how things have changed in so many ways – women no longer have to depend upon a man for support – yet there are still so many thing that haven’t changed – slamming a woman’s reputation over her alleged affairs/sexuality. Thanks for sharing this post about another one of history’s fascinating women. Reblogged this on For lovers of history. Brilliant. I knew nothing about this woman (not my usual era) but you have painted a fascinating picture of someone who had led a very interesting (if difficult) life.